Hailing from Hilltown, NJ, near New York City, Alan Buxbaum came to another major Eastern city region, the DMV, to complete his Master’s at the Peabody Conservatory. Initially, playing rock music while in high school, he transitioned into classical music because, although there can be complexity to rock music in other ways, “straight ahead rock music has simple chord progression,” according to Buxbaum. And he was interested in music that had other challenges than what that genre provided. 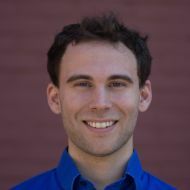 After double majoring in Percussion Performance and Composition, and minoring in Microtonality/Harry Partch Studies at New Jersey’s Montclair State University, Buxbaum studied at the Peabody Conservatory in Baltimore. Although initially a performer, his interest in conducting stemmed from an intellectual curiosity to delve deeper into music. He admits that he loves to play, however, Buxbaum states, “I felt like my brain needed more to dig into and was more interested in the bird’s eye view of things. Conducting seemed the natural path to take, as one must think about everything in a piece, from its conception, to its practical needs, to individual performing needs, to the piece's post-premiere life and so much more.” Regarding post-premiere life, Buxbaum explains that although purists may not agree with this approach, he does make himself aware of other practice performances and interpretations of pieces that he conducts to help him bring a new perspective to the piece. Catch young conductor Alan Buxbaum at the late April concert with DC Strings. Later this summer in the year he will appear at the Aspen Music Festival.